A rhythmic, wandering line has been present in Craig Kauffman’s paintings since the 1950s. 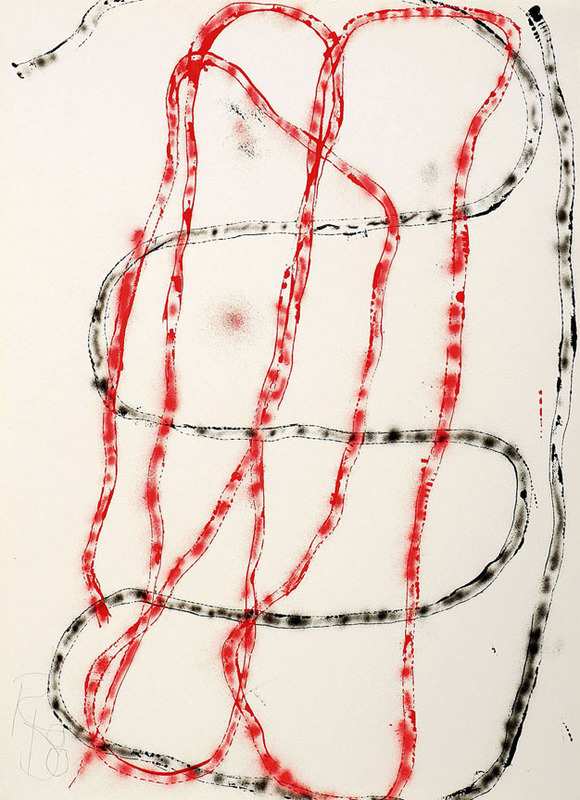 Based in his experiments with skipping, dotted lines made with ink on paper, the line in those paintings displayed a loose, calligraphic hand that seems to define form, yet also describe a suspended space. 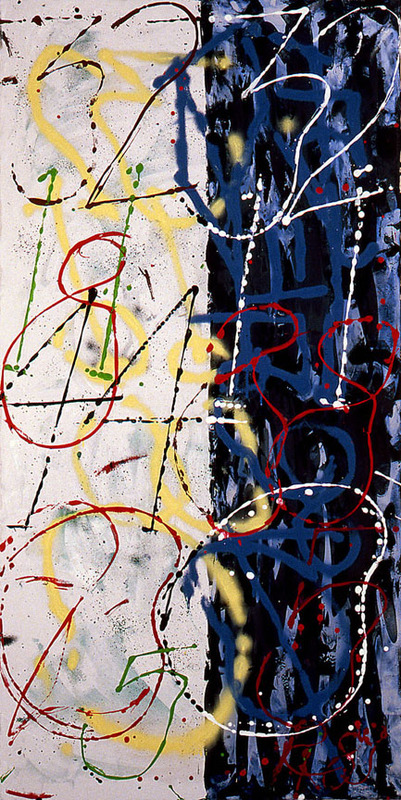 In the Numbers paintings from 1989, Kauffman employed that line again to make numerals, boldly drawn in paint and hovering over a colored ground of imagery. In the third exhibition to be drawn from the Estate of Craig Kauffman (1932-2010), the Frank Lloyd Gallery presents a series of paintings by Kauffman made in 1989. Kauffman’s interest in unorthodox application of paint and his love of the physicality of painting are accompanied by a brilliant color sense. Kauffman considered these works, which became known as the Numbers, to be a continuation of his use of calligraphic line, and an integration of sensuous color with architectural form. The paintings demonstrate a masterful range of painting’s language: dark versus light, the organic and architectural, and luminosity with density. The vertical composition of the Numbers paintings can also be strongly associated with Asian calligraphy. This clear structure of marking from top to bottom, and the reference to the format of a scroll, belies the artist’s life-long fascination with the arts of Japan, China and Southeast Asia. Indeed, his move to the Philippines provided him with easy access to Taiwan and Hong Kong, and his viewing of landscape paintings made with ink was made possible. “Japanese calligraphy is organized in columns and rows,” Belloli wrote, “and Japanese painting as one or several simple recognizable elements.” The format of the Numbers paintings not only recalls the influence of Asian painting, but also provides an expansive view of pictorial space, which Kauffman skillfully divides into a space for a specific purpose: a combination of linear and architectural form. Architecture was one of the artist’s passions since his teenage years. Kauffman was highly influenced by reading Kindergarten Chats, by Louis Sullivan and A New Vision, from Material to Architecture, by Laszlo Moholy-Nagy. These books lay out the foundations of modern art. Intended to inform readers about the elements of Bauhaus design, the text by Moholy-Nagy merges theory, art and design. The influence on Kauffman, and on his desire to create a new way of seeing the world through art, was profound. Kauffman’s architectural elements in the Numbers paintings also reflect his own practical experience of building. In the later decades of his life, Kauffman designed several homes, including four in the Philippines and one in the Central California town of Arroyo Grande. His eye and hand were naturally drawn to architecture, a profession he considered when he first entered college at the University of Southern California. The Numbers paintings contain some of the simple architecture of the Philippines, known as Kubo bamboo houses. The paintings present a merging of all of these elements: architecture, calligraphy, and painting. They are held together by the network of lines, executed in an architect’s italic block numbers. But the unity is also achieved by Kauffman’s extraordinary ability with brilliant color combinations—from the rich reddish column on the left to the subtle whites and greys on the right, or the overlays of red and green. 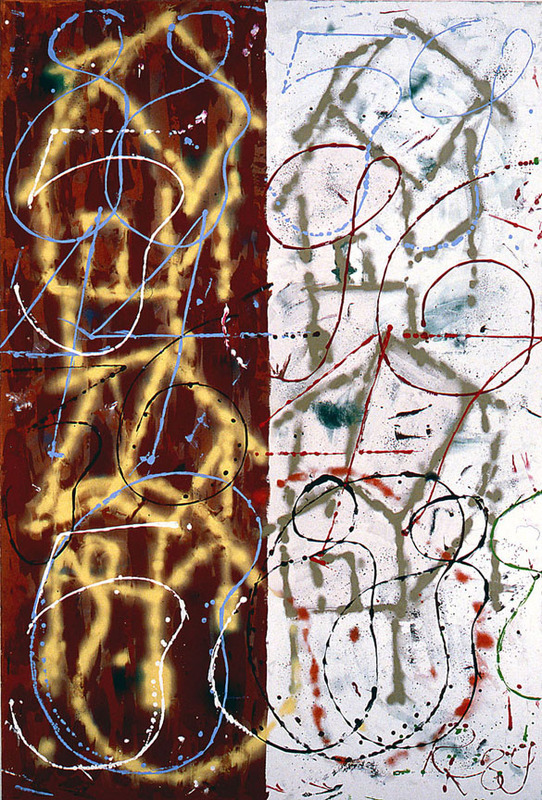 These eight paintings were not shown in Los Angeles, although some were included in the large survey of Los Angeles painting, Abstraction, mounted by the Nagoya City Art Museum in 1990. That Nagoya exhibit included the work of Kauffman, Sam Francis, John Altoon, John McLaughlin and Ed Moses. The eight major paintings in the current show are accompanied by five works on paper. Hunter Drohojowska-Philp, Craig Kauffman: Sensual Mechanical, Frank Lloyd Gallery and the Estate of Craig Kauffman, 2012, p. 73. Noriko Fujinami, Abstraction: John Altoon, Sam Francis, Craig Kauffman, John McLaughlin, Ed Moses, Nagoya City Art Museum, 1990. That’s a great article. I’m a architecture student and i’m doing some research about some artists for my monograph that is a museum in Brazil for 6 artists: Craig Kauffman, Larry Bell, James Turrell, Jonh MacCracken, Robert Irwin and Peter Alexander. Your blog has a lot of information I need for my work and a lot of good articles, congratulations!